Modern / Luxury Rowhome in the Heart of DC! Modern and luxurious, with updated amenities, lots of space, and lots of light. You’ll love my stunning and spacious corner house. Modern and luxurious, with updated amenities, lots of space, and lots of light. It is the ideal environment for a city getaway. 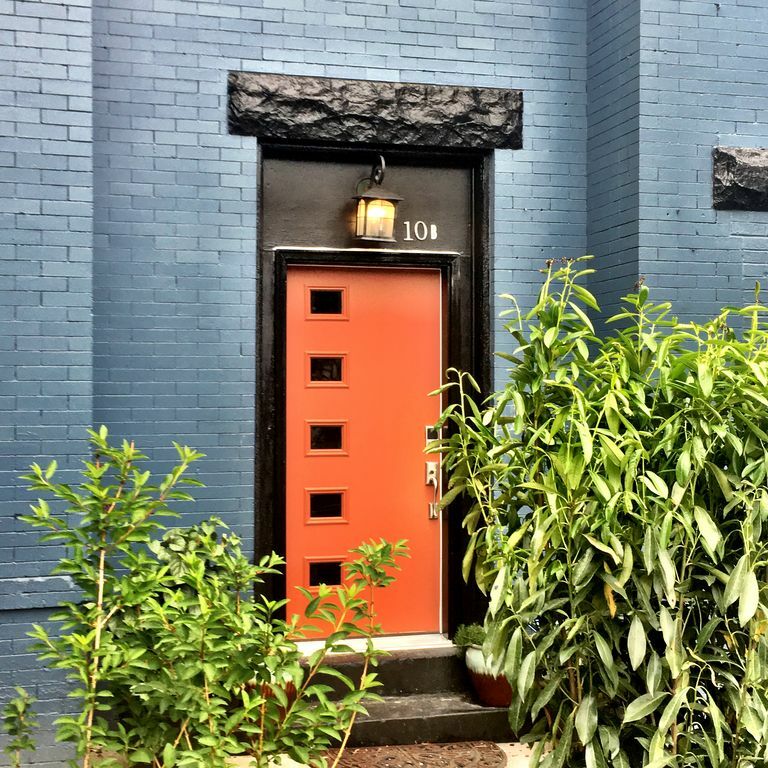 Located in a great location that's central to Bloomingdale, U Street Corridor, Shaw, and Eckington. Tons of transportation options. The space offers numerous beds and accommodations to fit your needs. Good for couples, solo adventurers, business travelers, families, and great for big groups. Stunning Semi-detached corner house! Stately Victorian in vibrant Eckington boasts modern / updated designer finishes ! Court yard & Carriage house. My unique and comfortable home has plenty to offer - including a fully equipped kitchen, elegant open layout, inlaid cherry wood floors, modern marble bathrooms, individual heat/AC in unit, washer & dryer, and much more. It's a great base for your short-term or longer-term stay. You'll have full access to our secluded outdoor patio and green space, with a grill, hammock, picnic table, and rope swing for the kids! We offer guest parking passes, and a roof deck with beautiful views of the District. We can accommodate stays of any length. The property is a corner row house and ideal for long-term stays, eg. for business, short-term work, fellowships, or internships. Additionally, there is a pool on the same block as the property -- it is a public pool -- it's a hidden gem, and kept in pristine condition. Master bedroom is equipped with a comfortable Queen-size bed, with a private, connecting, full bathroom. Second bedroom offers a comfy Queen-size bed and also is adjacent to its own updated private bathroom. All rooms are private and dark at night. For larger groups, there are 2 very comfortable futon & sofas available for your use. Kitchen: The gourmet kitchen is fully-equipped with high quality appliances for you to use, including an oven, 6-burner stove, fridge, freezer, toaster, dishwasher, a capsule & drip coffee maker , a microwave, cooking utensils, and tons of storage space. •	TV’s: There are 2 TV’s in the house, offering Roku/Netflix/HBO and all the main channels in HD so you don't miss any news or sports ! Also they all have HDMI(Non Mac’s)/Lightning Bolt (MAC laptop) cords attached . Sleeping: Comfortable Queen-size bed in master bedroom with connecting private (full) bathroom. Second bedroom offers a comfy Queen-size bed and cozy bedroom. All rooms are quiet, private and dark at night Kitchen: The gourmet kitchen is fully-equipped with Oven/ 6 burner stove / Fridge / Freezer / toaster / dishwasher and a capsule & drip coffee maker (stocked with a variety of delicious teas & coffees), a full-size fridge, toaster oven, microwave, dishwasher and tons of storage space. Private entrance / keyless entry. You'll also have your own access to the beautiful, private courtyard / backyard and roof deck with views of our Nation's capitol! My friend and co-host Caroline is available to help you at any time. She responds quickly, and is only a text or phone call away. Caroline and I will help you get settled, provide any travel tips, answer questions, and even give you dining recommendations that fit your lifestyle. Whatever your needs are, please let her know! The Home is on the border of the 3 hottest neighborhoods in D.C.: 1. Shaw: Commercial action is centered here and on nearby U St. Corridor, a local choice for good food and good fun. The rest of the neighborhood is mostly row houses and friendly, independent businesses. Students from nearby Howard University keep the area feeling young at heart, while great transportation links Shaw easily to DC's downtown areas. Palpable evening energy emanates from some of DC's newest hotspots along neighboring 14th Street, a quick walk or bus ride away. 2. Bloomingdale: Bloomingdale wasn’t part of Pierre L’Enfant’s original plan, and started out as a pretty rural area. It was next to the planned suburb LeDroit Park, and didn’t really see much residential development until the 1890s when streets were paved and a streetcar connected through the area. Bloomingdale quickly became home to rowhouses, churches, and schools, and has remained a quiet, residential neighborhood ever since. Bloomingdale boasts everything from chill dive bars, to yoga studios, to Gearin' Up, a local bike co-op, right off the nearby Metropolitan Branch Trail, the perfect place to go for a bike ride and check out some of DC's best murals. 3. Eckington: Lots of great bars, restaurants, and new developments are beginning to characterize Eckington, a classic D.C. neighborhood that connects Rhode Island Ave NE and New York Ave NE. Check out the coolest new food vendors in the city at nearby Union Market, a DC food hall / food laboratory in the old warehouse district. Then hop on the red line at NoMA-Galluadet station to head downtown. Neighborhood Character: The neighborhood consists of several blocks of tree-lined streets of Victorian rowhouses with porches and front stoops, and residents make use of them. Elle, In Bloom writer, and an area resident, says her favorite thing about the neighborhood is that “it can take over an hour to walk a block because my neighbors all want to say hello and have a chat.” Bloomingdale is a small neighborhood that hosts a number of community events, including a fantastic weekly farmers’ market (Sundays from 10 AM to 2 PM) and an annual Halloween block party called the Thomas Street Spooktacular. Big Bear Cafe is a local Bloomingdale favorite, and Windows Cafe has good sandwiches. Neighbors swear by Timor Bodega, an organic grocery featuring local produce. Bloomingdale is home to Crispus Attucks Park, a lovely, community-based neighborhood park. Other Restaurants and bars: A few blocks west into Bloomingdale, there are plenty of restaurants within 10 minutes walking distance to enjoy - The Pub and the People, The Red Hen, Boundary Stone, and Show Time Lounge, to name a few. If you keep going, you'll hit booming Shaw with its myriad of coffeehouses, local breweries, bars and clubs. Head east, and a short walk will take you through Eckington to Union Market, the old warehouse district, and the D.C. Angelika, one of the best independent movie theaters in NE. Address : If needed, we can provide metro cards. (Please top off the metro card balance during your stay, and return the card for the next guest.) The fastest way to get to the National Mall is by the 80 bus (15-minutes). It picks up right in front of the house. If you want to take the metro, the house is a 10-minute walk to the Howard University/Shaw Metro stop on the Green/Yellow Line. The house is a 5 minute walk to the NoMA metro station (Red line). It's a short 2 minute walk to two other bus lines (G8, P6). Besides public transit, Uber, Lyft and cabs are a great way to get around the city. I would recommend ordering an Uber or Lyft if traveling from the house. If you are new to uber / lyft, ask Caroline for her discount code which gives you a discount off your first ride. If hailing a cab, walk a few short blocks to North Capitol St. The Closest Airport : Ronald Reagan Washington National Airport Train Union Station is closest station, just 1 mile away! Totally private, so the space is all yours. Enjoy being a block from all of the best nightlife in D.C. -- The Brixton, Nellies, the 9:30 Club, and many of DC's most unique and fun restaurants. Located 1 block from the U St. metro stop (yellow/green lines) and Shaw/Howard University station (yellow/green lines). You can access downtown, sightseeing, office buildings, the Washington Convention Center, Chinatown, and even Nationals baseball games effortlessly. It is located "where you want to be" in DC. Furthermore, the house is nestled in the cutest Victorian brownstone neighborhood, with a lovely park and playground only three houses away. Parking ! There's typically lots of off-street parking close to the house. The block on the side of the house of the house is not zoned so there should not be issues parking during the day on weekdays, otherwise there are two hour limits for non-zoned cars. But I have a guest parking pass from the city I am always happy to share! My name is Will. I am a D.C. native and work in real estate! I live in the close by with my lovely girlfriend Caroline, She is a great resource and can help with any questions you might have, too! I love to socialize, be happy and laugh. BIG POSITIVE ENERGY PERSON. I am often driving, Email and phone calls are a good way to reach me, should you need additional information/ have questions. Please read the house rules and listing carefully and that will answer most of your questions. I live at the intersection of R street NE and Lincoln street NE Washington D.C. 20002. This should help you answer any location based questions. If there is anything that we can do for you prior to your arrival, please let us know and we will try our best to accommodate. We want to ensure your arrival and stay is an awesome experience !!! Your friends and family will have a great time. We look forward to hosting your crew !! My quiet and comfortable home has plenty to offer - including a fully equipped kitchen, pristine exposed brick walls, elegant open layout, inlaid cherry wood floors, modern marble bathrooms, individual heat/AC in unit, washer & dryer, and much more. It's a great base for your short-term or longer-term stay. You'll have full access to our outdoor patio and green space, with a grill, hammock, picnic table, and rope swing for the kids! We offer private, one guest street pass for parking , and a roof deck with beautiful views of the District. We can accommodate stays of any length. The property is a corner row house and ideal for long-term stays, eg. for business, short-term work, fellowships, or internships. Additionally, there is a pool on the same block as the property -- it is a public pool -- it's a hidden gem, and kept in pristine condition. Master bedroom is equipped with a comfortable Queen-size bed, with a private, connecting, full bathroom. Second bedroom offers a comfy Full-size bed and a cozy bedroom. Depending on what you may need (kids room / rec area, a futon, etc. - I'm happy to accommodate your needs) --All rooms are private and dark at night. For larger groups, there are 2 very comfortable futons / sleeper sofas available for your use. Kitchen: The gourmet kitchen is fully-equipped with high quality appliances for you to use, including an oven, 6-burner stove, fridge, freezer, toaster, dishwasher, a capsule & drip coffee maker (stocked with a variety of delicious teas & coffees), a microwave, cooking utensils, and tons of storage space. All major attractions (museums, capitol hill, white house, etc) are with one mile ! We found this space very accesible to the concert halls we were visiting. The Anthem, the Lincoln Theatre and the 9:30 Club were all very nearby. The windows were great for people watching during a rainy March afternoon. The apartment was cozy and perfect for having a small group. We look forward to visiting again. Had an awesome time in DC! This walk up was so cute. We are a musical family so having access to the piano was great! The location is amazing! As you drive into the National Mall you can see the Capital the whole way! It was really exciting to see the Washington Monument from the roof top access. You really feel like you're part of the city here. Just one block over is a FANTASTIC bar and grill called The Pub and The People. They don't serve regular bar food! Be ready for something special. Will was VERY responsive to all of our needs! Can't wait to visit again! Convenient location, modern, bright and sunny apartment. Will, the owner was helpful and friendly. Murphy takes care of any cleaning issues very promptly. Will are host was great. We had a couple small hiccups but he was on it. The apartment was roomy and had everything we needed. The location was great: hopped on a city bus a block away to Union Starion then either metro or Circulator anywhere we needed to go. The neighborhood had a local pub a block away and some exceptional dining up first street, especially recommend the Red Hen. Two weeks flew by. Would definitely rent again. You all were great guests!